Plans to cut the number of firefighters at a Worcestershire station by half could mean "extremely tired" crews under performing, warned the union. Hereford and Worcester Fire Service is meeting over plans to cut 32 of 322 frontline firefighter posts, including 14 of the 28 positions at Bromsgrove. Steve Gould, of the Fire Brigades Union, said at times Bromsgrove crews would be "doubling their workload". But fire chiefs say the move would not increase risk to the public or crews. 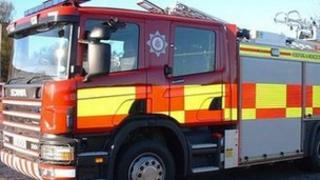 Hereford and Worcester Fire Service said it must save £3m over three years as a result of cuts. Area Commander Jon Pryce said the planned cuts, achieved through retirements over three years and not redundancies, would save about £1m. Under the proposals, 18 posts would go across stations in Worcester, Hereford, Evesham, Malvern and Droitwich. Meanwhile, 14 posts would be cut at Bromsgrove, which has seen its annual callouts fall from about 1,000 to 600, according to the service. Mr Pryce said the service currently had a "slight buffer" of staff, allowing for training and absence. He said a new crew system at Bromsgrove meant each engine would still be staffed by five firefighters. "It's really, really important to emphasise at this point that there will be no changes in service that the public see," he said. "They will have the same number of fire engines, there will be the same number of firefighters on those engines." However, Mr Gould said if the cuts were approved, it would mean a reduction of 62 firefighter posts in the two counties since 2003. "So the frontline has taken quite a kicking since 2003 already, so that's roughly 20% of frontline jobs," he said. He said Bromsgrove's frontline appliance attended 750 call outs last year when incidents it attended in other areas were included. This was high for the new shift pattern which was used in some stations with fewer callouts, Mr Gould added. "It will lead to, at times, firefighters being extremely tired," he said. "They will be doubling their workload so that is surely going to have an effect to the public." However, Mr Pryce said if this ever happened, other staff would be drafted in to help. He insisted that austerity measures would not compromise firefighter safety, public safety or quality, to which the service was "100% committed". The final decision on the changes is expected on 27 June.